Properties in Bessines-sur-Gartempe average 4.6 out of 5 stars. Property 5: Old house with BIO heated pool 2 to 6 pers. Property 8: Weir Cottage: Private Lakeside Gite In Idyllic Location. A Great Place To Relax! 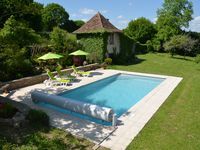 Property 9: Gite Le Segur has a homely feel with a modern standard. Quirky Traditional Limousin Town house full of character! Property 17: Quirky Traditional Limousin Town house full of character! Property 29: Holiday gite, rural location, 7 mins to St Pardoux leisure lake and 10 mins to A20.